The ultra luxurious executive Giant Eagle Owl Suite and King Cheetah Suite also have a private pool, dining room and second bathroom. Lukimbi has already created a name for itself as one of the new places to enjoy top cuisine. Meals both unusual and beautifully presented add to the whole enjoyable Lukimbi experience. Part of the fun is the changing of venues, so guests may enjoy breakfast in the bush, lunch round the pool and a glamourous candlelit dinner on the wooden decks. Maybe dinner will be in our amazing and mythical boma (or meeting place), an experience you won't forget, or perhaps our chefs will decide to do something completely different. The bar is a great pre-dinner gathering place to exchange game spotting stories, hear Shangaan tales and to sip cockails. To accompany our fine dining, we have a large cellar where guests are invited to select the best of South African wines, including many of the smaller and upcoming Estates. 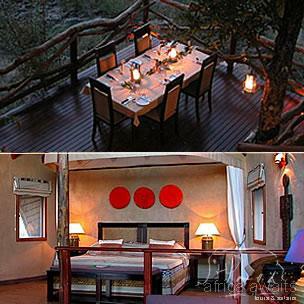 Lukimbi Safari Lodge was awarded Concession of the Year by the Kruger National Park at the annual Award Ceremony in March 2009. Lukimbi received Best Business Partner for 2008 Award from S.A. National Parks. 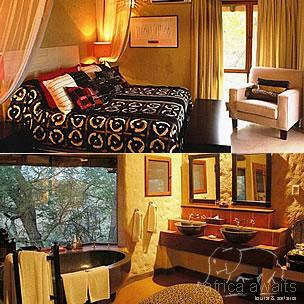 Lukimbi Safari Lodge was awarded Platinum Award by Diners Club International - Wine List of the Year 2009. 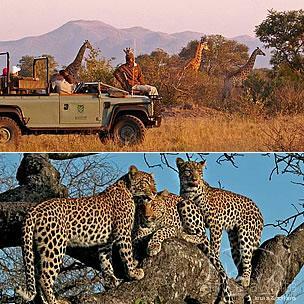 With your holiday, safari or business trip from in to Lukimbi Safari Lodge in Kruger National Park.